Horze Tendon Boots protect the fetlock and cannon bone and are excellent for everyday use and the needs of jumpers. These offer the highest standard of protection by dissolving shock waves away from tendons allowing airflow and support. 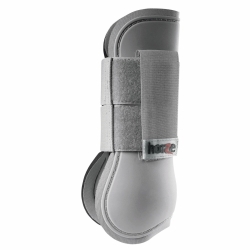 Horze tendon boots provide 360 degrees protection safeguarding cannon bone, tendons and soft tissue. A reinforced Velcro strap provides a safe, flexible, comfortable fit. Choose from a variety of colors to coordinate with blankets and pads.